Few people are blessed with naturally straight teeth and if you are one of them, then consider yourself lucky! However, if you are one of those individuals with crooked or misaligned teeth, you need the help of a dentist or orthodontist to set your teeth into their proper position. Although there are some ways you might be able to straighten your teeth at home without wearing braces, such as using over-the-counter removable aligners, it’s still best to consult a professional who has the knowledge about straightening your teeth safely and more efficiently. Wearing braces is not the only way to achieve a beautiful smile and have straight teeth. Here’s how to straighten your teeth without braces. 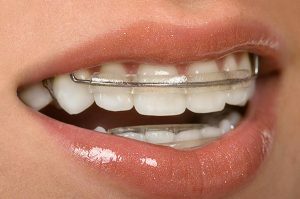 Retainers – fixed retainers are attached using dental cement to the teeth’s inner surface to prevent them from shifting over time, helping correct your bite and straighten your teeth. Appliances – one example of this is the Herbst appliance, a device that straightens teeth by correcting imperfections. The Herbst appliance adjusts the bite by allowing the lower jaw to develop in a forward direction. Palatal Expanders – orthodontists recommend palatal expanders if the child’s mouth is too small for future adult teeth. They are used to widen the arch of the child’s upper teeth, creating space for the teeth to move naturally into their ideal positions as they grow. Keep in mind that the best person who truly knows how to straighten your teeth with or without braces is your orthodontist. Your dentist at Cardiff Dental will first examine your teeth and determine the best straightening option. Also, getting your dentist to check your teeth ensures that whatever treatment you pick is not harmful to your oral health and well-being in the long run. You need an expert to look at your case and provide the best options available.